Background: It has been hypothesized that phototherapy leads to increased calcium absorption by the bones through irradiating the pineal gland and reducing melatonin level. 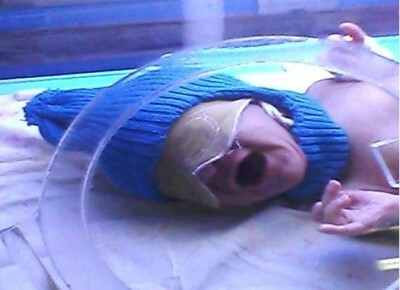 There is some evidence that the use of a stockinet cap to cover the head prevents phototherapy-induced hypocalcemia. Study design: This was a randomized controlled trial, including 124 full-term neonates, weighing >2,500 g, in the first 7 days of life, who developed a bilirubin level ranging from 15 to 20 mg/dL and needed treatment with phototherapy. Our neonates were divided into two groups: Group A without the hat, and Group B with the hat. We designed a dark-colored hat that covered the entire head, including the occipital area, ears, and neck, to prevent passage of light. The hat was used from the time of admission and for the 48 hours of treatment with phototherapy. Ca levels were measured on admission and after 48 hours of phototherapy. The variables were compared using Student’s t-test, chi-square test, and the repeated-measures test. Results: There was no difference in the mean Ca levels in the two groups on admission. However, after 48 hours of phototherapy, there was a trend toward an increased Ca level in the group with the hat; 8.74±0.95 mg/dL vs 8.51±0.24 mg/dL in the control group. Moreover, there was a statistically significant decrease in the incidence of neonates with hypocalcemia in Group B (with hat) in only six cases (9.7%), compared to 15 cases (24.2%) in Group A (without hat; P=0.031). Conclusion: Phototherapy-induced hypocalcemia can be prevented by covering the head during phototherapy. This seems to be a safe, effective, and cheap method to prevent hypocalcemia and its complications, with no need for prophylactic administration of calcium.